If the Lite edition doesn’t meet your demands, you can find functions that you want in the below table and upgrade to advanced edition at a discounted price. Create, format, delete, label and check partitions, set active partition, change drive letter, disk surface test, convert FAT32 to NTFS, etc. Fully support Windows Server 2000, 2003, 2008 (R2), 2012 (R2), 2016, 2019, SBS 2011 and Windows 10, Windows 8.1, Windows 8, Windows 7, Vista, XP (32/64-bit). Convert disk between MBR and GPT partition styles without data loss, convert partition type between primary and logical without data loss. Allocate free space from one partition to another, merge two partitions into one, merge unallocated space into C drive, split one partition into two drives. Resize, move, extend, shrink, create, delete, format dynamic volumes, add drive to Software RAID, convert dynamic disk to basic disk without data loss. Align partition to match the olue, underlying block solucture so that your disk will gain ideal performance during data access, especially for SSD. Perfrom hard disk partition management from command prompt. Migrate OS from HDD to SSD, migrate OS between MBR and GPT disks. Clone a disk to another for hard drive upgrade or data backup. Recover deleted and/or lost partitions on a hard drive. Create a Windows PE bootable rescue disk to manage hard disk partitions when system fails to boot. Build a portable and fully functional Windows 7/8/8.1/10 system on a USB flash drive. Integrate AOMEI Partition Assistant or AOMEI Backupper installed on your computer into the recovery environment of current system. The maximum number of computers allowed to install the software. 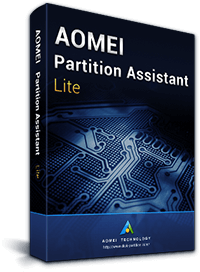 Tips:For IT professionals, technicians, and consultants who would like to provide revenue-generating technical services to their clients, please choose AOMEI Partition Assistant Technician Edition. Advanced PC and server partition manager designed for IT professionals, consultants, system administrators, and technicians to provide billable technical service to clients.